Hudson River, likely near West Point, ca. 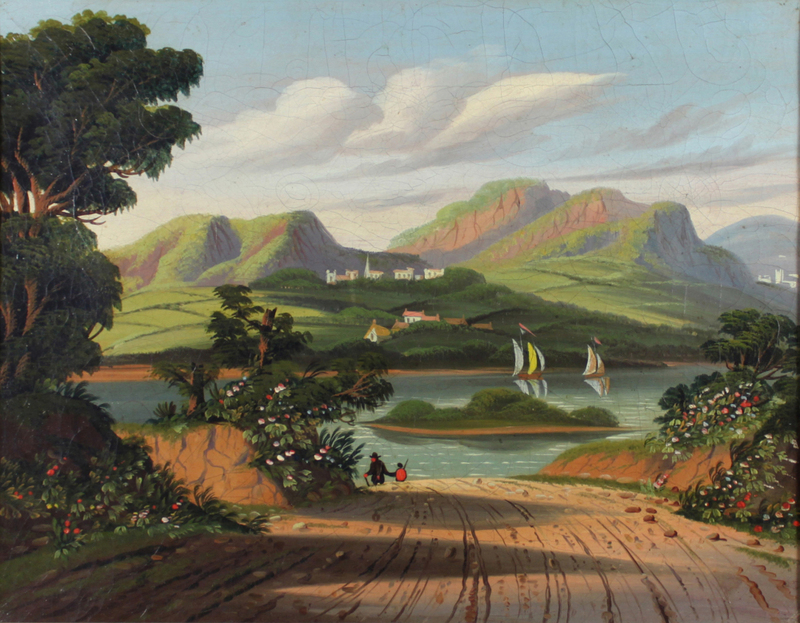 1840-1850. 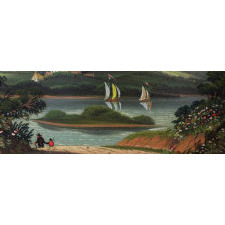 Thomas Chambers (1808-1869) is well known for his highly imaginative paintings characterized by areas of bright, flat color, large generalized forms, and sharp contrasts between light and dark areas, with playful, romantic exaggerations that reflected the "fancy" taste of his prosperous patrons in New York and New England. This painting is especially vibrant, highlighted by the lines in the road leading to the fisherman or hunter and his son dressed in bold red, flanked by splashes of colorful flowers. 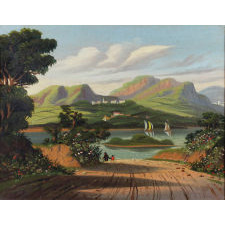 One's eye is drawn into the river by the sailboats, accentuated by the yellow sail, then directing one's eyes up to the distant mountains and towns. The depth of the shadows emphasizes the bright mood of the sunshine. This painting is in superb condition, with expected craquelure, NO IN-PAINTING and the original stretcher. Museum wax lining. 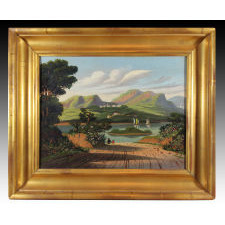 The gilded frame is not the first yet presents the image beautifully. Frame size about 23 1/2 inches wide x 19 1/2 tall. Labeled on the reverse: Ralph Brill Collection, Cold Spring, NY, 10516. Museums with paintings by Chambers include: Addison Gallery of American Art, American Folk Art Museum, Dallas Museum of Art, Everson Museum of Art, Fenimore Art Museum, Flint Institute of Arts, Indiana University Art Museum, Mead Art Museum, Metropolitan Museum of Art, Minneapolis Institute of Arts, Museum of Fine Arts, Boston, National Gallery of Art, New-York Historical Society, Rhode Island School of Design, Saint Louis Art Museum, Shelburne Museum, Smith College Museum of Art, The Brooklyn Museum of Art, Wadsworth Atheneum. 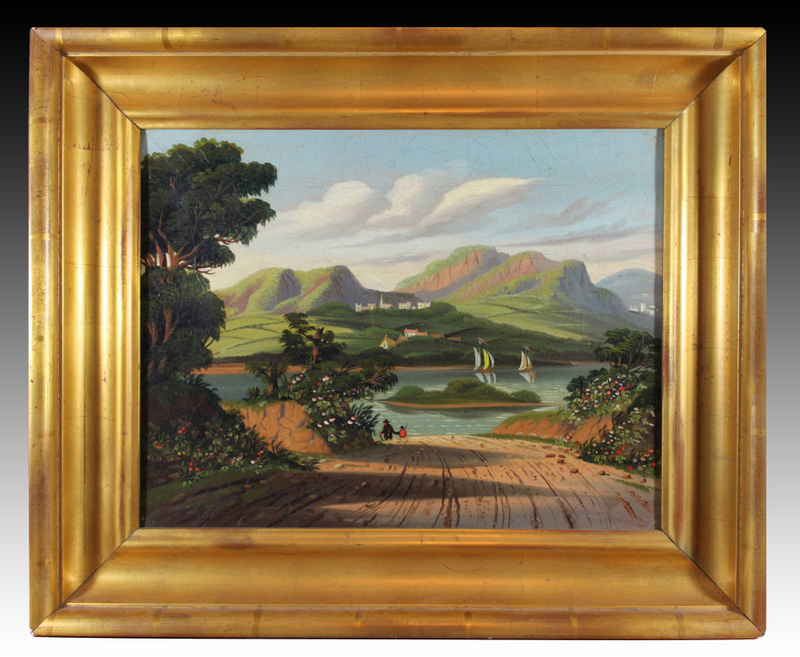 See "Thomas Chambers: American Marine and Landscape Painter, 1808-1869", Foster, for extensive reference.